Clean leek and cut into small pieces. Pluck mint leaves from the stems and finely chop. Crumble feta cheese into a bowl. Heat olive oil in a frying pan over medium heat and sauté leek for approx. 10 min., or until soft. Add to the bowl, together with the chopped mint. Season with salt and pepper and stir to combine. Preheat oven to 200°C/400°F. Melt butter in a pot over medium heat. Roll out phyllo pastry. Halve phyllo and brush with melted butter. Transfer 1 tbsp of the cheese-leek mixture onto the phyllo and fold as desired. Continue with the rest of the filling. 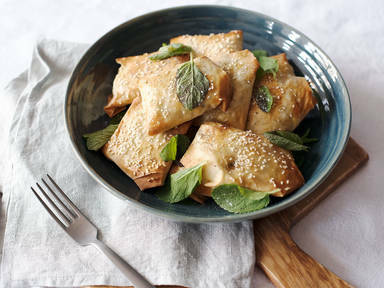 Transfer phyllo bites to a baking sheet. Separate egg and beat egg white. Brush with egg white and sprinkle with sesame seeds and salt. Bake at 200°C/400°F for approx. 12 – 15 min. Garnish with mint and season to taste with salt and pepper. Enjoy!